Well, 311 works, apparently. Recently, I posted about some truly awful street situations on 46th, 6th Avenue, and 41st Street. As of earlier in the week, 46th Street has been fixed, 41st Street has been worked on and is waiting to be re-paved, and 6th Avenue is, as you can see in the photos above and below, neatened up and dubbed with an updated posting. 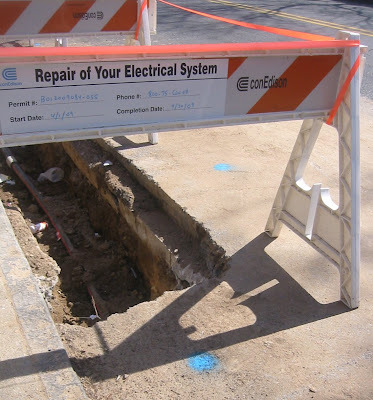 Now the work is supposed to be completed by April 30th, 2009. 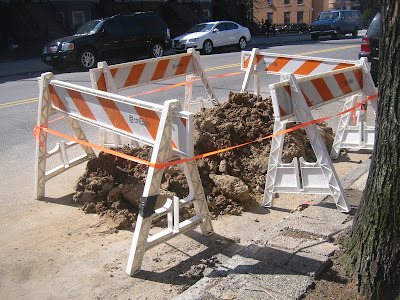 Don't forget, if there are situations like damaged signs, huge craters in your street, unsafe construction sites, or other issues around your neighborhood, calling 311 is always an option. The last few times I've called have been short, effective, and pleasant calls. I've had to call 311 a bunch of times, because my neighbor has a rooster and it wakes me up every morning. They've done nothing for me at all. I know that in the case of roosters (funny that it's so common! ), you have to have the exact street address. Roosters aren't allowed in NYC as pets anyway.